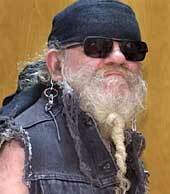 La Monte Young has pioneered the concept of extended time durations in contemporary music for over 47 years. He contributed extensively to the study of just intonation and to the development of rational number based tuning systems that are used in his periodic composite sound waveform environments, as well as in many of his major performance works. Presentations of Young's work in the U.S. and Europe, as well as his theoretical writings, gradually influenced a group of composers to create a static, periodic music which became known as Minimalism. Musician magazine stated, "As the acknowledged father of minimalism and guru emeritus to the British art-rock school, his influence is pervasive," and in 1985 the Los Angeles Herald Examiner wrote, " for the past quarter of a century he has been the most influential composer in America. Maybe in the world." In Minimalism:Origins, 1993, Edward Strickland added, "Young is now widely recognized as the originator of the most influential classical music style of the final third of the twentieth century." In L.A. in the '50s Young played jazz saxophone, leading a group with Billy Higgins, Dennis Budimir and Don Cherry. He also played with Eric Dolphy, Ornette Coleman, Terry Jennings, Don Friedman and Tiger Echols. At Yoko Ono's studio in 1960 he was director of the first New York loft concert series. He was the editor of An Anthology (NY 1963), which with his Compositions 1960 became a primary influence on concept art and the Fluxus movement. In 1962 Young founded his group, The Theatre of Eternal Music, and embarked on The Tortoise, His Dreams and Journeys (1964- ), a large work involving improvisation within strict predetermined guidelines. Young played sopranino saxophone and sang with the group. Dennis Johnson, Terry Riley, Angus MacLise, Marian Zazeela, Tony Conrad, John Cale, Jon Gibson, David Rosenboom, Jon Hassell and Lee Konitz are among those who worked in this group under Young's direction. With Marian Zazeela in the early '60s, Young formulated the concept of a Dream House, a permanent space with sound and light environments in which a work would be played continuously. Young and Zazeela have presented works in sound and light worldwide, from music and light box sculptures to large-scale environmental installations, culminating in two Dia Art Foundation realizations: the 6-year continuous 6-story Harrison Street Dream House (NYC 1979-85) and the 1-year environment (22nd Street NYC 1989-90) within which Young presented The Lower Map of The Eleven's Division in The Romantic Symmetry (over a 60 cycle base) in Prime Time from 112 to 144 with 119 with the Theatre of Eternal Music Big Band. This 23-piece chamber orchestra was the largest Theatre of Eternal Music ensemble to appear in concert to date. Young has since presented Dream House sound environments at Espace Donguy, Paris (1990); Ruine der Kunste, Berlin (1992); Pompidou Center, Paris (1994-1995 and 2004-2005); Musee Art Contemporain Lyon (1999) and the MELA Foundation Dream House: Seven+Eight Years of Sound and Light, which opened at MELA Foundation, New York in 1993 and will be on view through 2008. Young and Zazeela helped bring renowned master vocalist Pandit Pran Nath to the U.S. in 1970 and became his first Western disciples, studying with him for twenty-six years in the traditional gurukula manner of living with and serving the guru. They taught the Kirana style and performed with Pandit Pran in hundreds of concerts in India, Iran, Europe and the United States and continue to perform with their own group The Just Alap Raga Ensemble. In June 2002, Young was conferred the title of Khan Sahib by Ustad Hafizullah Khan Sahib, the Khalifa of the Kirana Gharana and son of Pandit Pran Nath's teacher, Ustad Abdul Wahid Khan Sahib. The 1974 Rome live world premiere of Young's magnum opus The Well-Tuned Piano (1964-73-81-present), was celebrated by a commission for him to sign the Busendorfer piano, which remains permanently in the special tuning. Gramavision's full-length recording of the continuously evolving 5-hour-plus work has been acclaimed by critics to be "the most important and beautiful new work recorded in the 1980s," "one of the great monuments of modern culture" and "the most important piano music composed by an American since the Concord Sonata." At the 1987 MELA Foundation La Monte Young 30-Year Retrospective he played the work for a continuous 6 hours and 24 minutes. In the '80s and '90s, The Theatre of Eternal Music Brass and String Ensembles led by Ben Neill and Charles Curtis presented numerous performances in the U.S. and Europe of The Melodic Versions (1984) of The Four Dreams of China (1962), one of Young's most important early minimal works, from which in 1991 Gramavision released a CD of The Second Dream of The High-Tension Line Stepdown Transformer. In 1990 Young formed The Forever Bad Blues Band, which has performed extensively in Germany, Austria, Holland, Italy and the U.S., presenting two to three-hour continuous concerts of Young's Dorian Blues, with Young, keyboard, Jon Catler, just intonation and fretless guitar, Brad Catler, bass, Jonathan Kane, drums, and Marian Zazeela, light design. In 1993 Gramavision released the 2-CD set, La Monte Young, The Forever Bad Blues Band, Just Stompin'/Live at the Kitchen. For La Beaute, the celebration of the Year 2000, the French government invited Young and Zazeela to create a four-month, large-scale Dream House installation featuring the continuous DVD projection of the 1987 six-hour 24-minute performance of their collaborative masterwork, The Well-Tuned Piano in The Magenta Lights, set in a site-specific light environment created by Zazeela. Shown daily and visited by more than 200,000 people, the installation was headlined by L'Express: "La Monte Young: Le Son du Siecle." From May through October 2001, Kunst im Regenbogenstadl, Polling, presented the German premiere of the DVD Dream House installation, continuing in 2002, 2003 and 2004 with the addition of the European premiere of an electronically generated continuous periodic composite sound waveform environment of The Magic Opening Chord from The Well-Tuned Piano. In March-April 2002, MaerzMusik Festival of the Berliner Festspiele premiered the DVD installation of The Well-Tuned Piano in The Magenta Lights set in Zazeela's light design for the monumental Berlin Staatsbank. Just Dreams released the DVD of The Well-Tuned Piano in The Magenta Lights (JD002) in 2001, described by The Village Voice as "The most important piano work of the late 20th century." In 2003, under commission from four European organizations, Young and Zazeela created Just Charles & Cello in The Romantic Chord in a setting of Abstract #1 from Quadrilateral Phase Angle Traversals with Dream Light, for solo cello, pre-recorded cello drones and light design. The full evening work was composed specifically for cellist Charles Curtis, who premiered it in Paris, Dijon, Lyon, Berlin and the Kunst im Regenbogenstadl Dream House, Polling during 2003-2004. In 2005, the world premiere video installation of The Just Alap Raga Ensemble performing Young's composition Raga Sundara set in Raga Yaman Kalyan was added to the long-term Regenbogenstadl Dream House.